National Grid: What Is It & How Does It Work in 2018? National Grid is the responsible for the gas and electricity transmission networks in Great Britain and ensuring that supply meets demand. 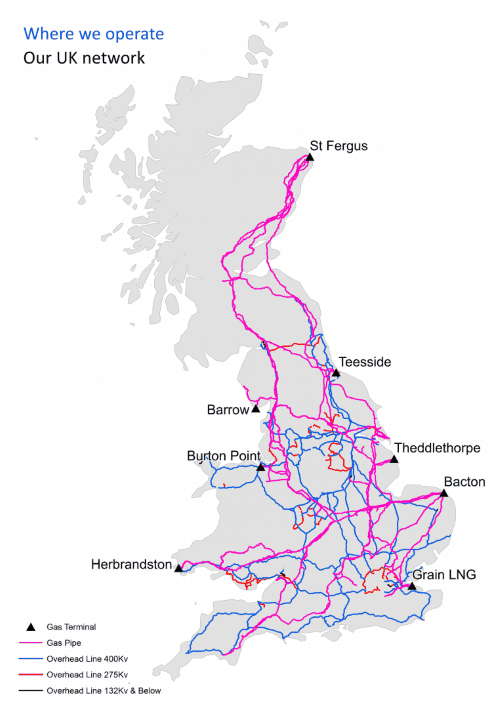 The National Grid owns and operates the electricity transmission network covering England and Wales. The transmission network in Scotland is owned by two companies, Scottish Power and SSE, but the National Grid operates it. They also own and operate the gas National Transmission System in Great Britain. The National Grid’s role in the electricity and gas transmission network is to manage the flow of energy and balance the supply and demand of both gas and electricity to homes and businesses in Britain. In addition, they are responsible for the quality of the electricity and the security of the supply. They manage gas and electricity supply and demand on real-time basis ensuring that there is sufficient energy to meet demand. They are also responsible for accounting for any energy losses in the network and reducing these losses. If a power cut occurs you should call 105 (lines are open 24 hours a day, seven days a week and are free-of-charge) to be connected to your local distribution network operator who will log and investigate the power cut. You can also visit the Power Cut 105 website for advice and support during a power cut or how to plan for a scheduled power cut. Call the National Gas Emergency Service on 0800 111 999 immediately, lines are open 24 hours a day, seven days a week. How Does the National Grid Differ from the Rest of the Energy Network? The National Grid operates the electricity distribution network that transports electricity from the generators to the local distribution networks. The electricity is transported at a higher voltage than what it can be used at so that it makes it easier to transport and it suffers from fewer losses. The local distribution network operators are responsible for converting the electricity to a lower voltage and delivering it to the end user. They operate and maintain their own electricity networks. The National Grid also operates the gas distribution network and like the electricity transmission network, they only transport gas from the shippers to the local distribution networks. They do not manage or own the local networks. The supply of gas and electricity and billing customers is the responsibility of the energy supply companies who pass on the charges for utilising the National Grid and local distribution networks to the energy customers. How is the National Grid Regulated? The National Grid operates under strict regulation both from the UK government and Europe as well needing to comply with various standards and licence requirements. Ofgem is the energy industry regulator and they place various restrictions and requirements on the National Grid which include price controls and standards. They license the National Grid’s operations under the Gas Act 1989 and Electricity Act 1989, which requires them to maintain and operate efficient and cost-effective networks for gas and electricity. There are numerous documents that they must produce each year to prove compliance with the electricity and gas industry standards and licence requirements. As well as reaching performance incentives for their gas and electricity system operations. Ofgem has also introduced a regulatory framework aimed at incentivising network companies to innovate and secure investment to deliver more sustainable energy networks at the lowest cost. This framework is called RIIO which stands for Revenue = Incentives + Innovation + Outputs. The delivery of RIIO is integrally linked to the revenue that the National Grid is able to generate. In addition, there are numerous regulations and codes that the National Grid must meet under EU requirements. There are many EU network codes that need implementing over the next decade that will be challenging for the National Grid. How Does the National Grid Manage Capacity? It is the National Grid’s responsibility to produce energy services to meet the energy demand and supply in the British transmission system to ensure the security and quality of the energy supply. The Electricity Market Reform allows the National Grid to manage the electricity capacity in the transmission network through the Capacity Market which is open to all electricity generators, electricity storage plants, voluntary demand reduction, and interconnectors. This gives predictability in the energy market to encourage future investment as it gives them capacity payments to deliver energy at times of greater need or they face penalties. Providers can secure capacity payments by participating in competitive auctions which sets the level of these payments. These auctions are held four years in advance of the delivery with a further auction one year ahead. 2018 will be the first year of delivery under the Capacity Market framework. When a high-stress occurrence is expected and energy demand will be higher than supply they will issue a notice four hours ahead of the need. How is the National Grid Funded? The National Grid is funded through charges to the companies that use its network to transport electricity from the generator to the end user. Ultimately the energy users pay for the costs of the National Grid via their energy bills. These pass-through charges from the National Grid typically account for less than 5% of the average electricity bill. The National Grid also recovers its costs from the installation and maintenance of connecting assets to the transmission network. These charges are calculated each year and charged each month. The National Grid’s revenue for gas transportation charges is restricted by Ofgem and there is a price formula to calculate this. If the amount is less or more than this amount in a year, then the following year will be adjusted to reflect this. This price control affects the Transportation Owner and System Operator charges. The Transportation Owner charges are split between exit and entry volumes. Entry charges are determined by auctions. System Operator charges are recovered from the Commodity charge which is a fixed charge. Gas shippers and distribution network operators pay these charges and the costs are passed on to the gas customer through their bills. How Do You Connect to the National Grid? The National Grid only deals with the connection of industry-related and large generation connections. They do not deal with the connection of domestic properties, small to medium industrial properties, and smaller energy generators, these are dealt with by the local distribution network operator. The National Grid can connect a range of gas customers including power stations, distribution networks, and large-scale industrial businesses. They also connect new indigenous gas forms like biomethane producers, shale, smaller-scale gas generators and compressed natural gas users. Connection service includes entry, exit, and storage. As the National Grid only serves the gas and electricity industry there is no complaints process for domestic or business energy users. If you have a complaint regarding the gas or electricity network supplying your home or business, you should contact your local distribution network operator. If you have a complaint regarding your gas or electricity bills, you should contact your energy supplier. There is a team that deals with issues relating to any National Grid assets that are on privately owned land. If you are a landowner, you can contact them by email. In 2019, there will be a significant shift in the National Grid business as they are separating their electricity system operator from their electricity transmission owner, and these two functions will operate as two separate entities. The reason behind this is to assist the business to operate each function independently, keep energy bills down, and aid the growth of a more flexible grid. There are significant challenges facing the UK energy industry including ageing infrastructure, decarbonisation, the requirement to create a smart grid, and energy storage. Investment is desperately needed to allow the energy industry to adapt and create a network that meets future needs and to create a smart grid. There is much resistance in increasing energy prices to pay for this investment and therefore the government needs to intervene and assist the industry. The National Grid is working with the government and the rest of the energy industry to assist in reducing carbon emissions for energy and decarbonising gas and electricity. This makes National Grid’s role more challenging as the drive is to move towards more renewable energy and potentially nuclear energy. Renewable energy has many challenges as the supply of electricity is not constant or predictable but is more flexible as it can be switched off almost instantly when the demand is low. The advancements in energy storage technology are increasing in pace due to there being a race to create effective energy storage solutions and it is attracting a lot of investment. Effective energy storage will make renewable energy more feasible on a larger-scale and enable the proportion of renewable energy in the UK electricity mix to increase substantially. Renewable energy is also more localised which meets the drive towards more localised energy production to reduce the demand for transporting significant amounts of electricity from key areas of the country. Nuclear energy provides a stable energy supply, but it is very inflexible as it requires significant notice to reduce its output. It also is not the cheapest or greenest solutions to produce electricity and does not fit in with the drive for localised electricity production. Gas plays a part in the electricity fuel mix in gas-fired power stations as well as for heating and cooking. Gas has a role in the decarbonisation of energy in reducing the need for coal-fired power stations as gas can replace them and provide the stability of electricity and a back-up for renewable energy’s intermittent supply. There are also the impacts of introducing biomethane and other gases into the mix that need further consideration and investment.